We managed to get another good route filmed today - but only just. It's good news as we have a lot more filming to fit in over the next 8 months with a range of climbers, all part of our new trad climbing film due out in October 07. 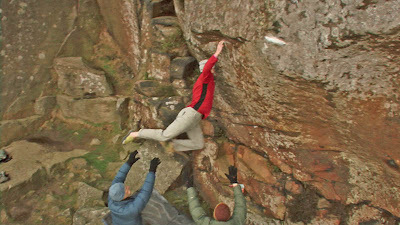 This time we were back in The Peak on a day raid to film Dave MacLeod try and send Blind Vision, Adrian Berry’s route graded E10 7b. 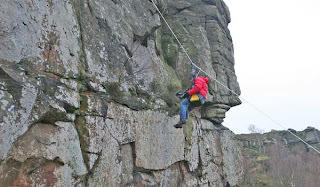 The route at Froggatt and it starts off up the boulder problem, Slingshot. The first move has something of a reputation. When first put up by Jerry Moffatt in 1988, it was hailed as “the hardest move in the world” and given the mythical british 7b grade. Dave had managed to spend only about 3 hours in total on the route spread over several rain interrupted days during the last fortnight. Nevertheless he was confident and psyched to get it done today, this being the last chance for a while due to other commitments. We arrived in the peak at midday to discover that the weather forecast got it wrong again. We sat out the showers for a few hours after and well after the point that most people would have bailed... the rain finally stopped and we sprinted to the crag. One hour of daylight left. It gets dark at about 4.15 so the action was pretty manic, however we managed to get it shot well, 6 camera angles. The only downside was that when Dave topped out at 4.40pm it was ridiculously dark. No time for re-shoots or cut-aways. . Pack up and nurse the ailing car back to Edinburgh. For more news about Dave’s ascent of Blind Vision see his blog. Dave MacLeod after topping out in the gloom, 4:40pm long after sunset. Tony Waite had come along too for the 18 hour round trip, to help with filming and to belay, so thanks Tony. Next stop for me is Austria on Friday for some mixed climbing, then off to Italy for the Ice Climbing World Cup. Diff we be in the UK, hopefully filming, if we get any decent weather?